Free Shipping Included! 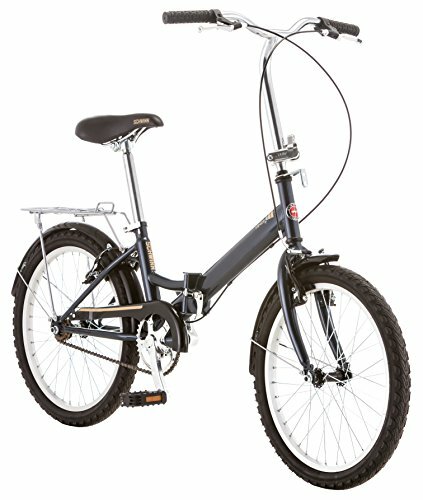 Schwinn 14 Hinge Folding Bike, 20-Inch/Medium, Grey by Schwinn at Joes V Cycle. MPN: S2278C. Hurry! Limited time offer. Offer valid only while supplies last. A versatile bike for commuting the Schwinn Hinge will fold up and out of the way. A bike when you need it and as small as possible when you don't. A versatile bike for commuting the Schwinn Hinge will fold up and out of the way. A bike when you need it and as small as possible when you don't. The stylish features make the trip fun and easy. The rear carrier is perfect for hauling groceries. The low stand-over folding frame and pedals are easy to fold and the matching fenders will keep you clean and dry in wet weather. The Hinge also comes with a handy storage bag. Enjoy the ride on a Schwinn.